It was terrible weather in Liguria today which brought a lot of wind, rain and goals. 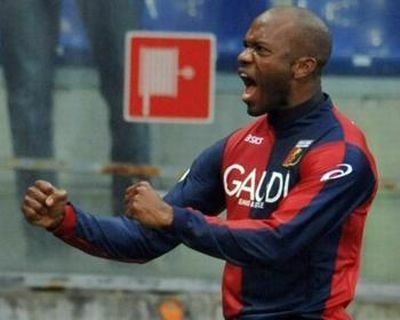 Genoa took 3 times the lead, but Bologna always came back and 10 mintes before the end our ex-player Adailton scored his 3rd and Bologna’s 4th goal. With David Suazo as substitute of Robert Acquafresca who scored twice last week against Udinese our team started very good. In the 8th minute Suazo opened the score to be very attent at the moment the goalkeeper of Bologna could hardly save the shot of Dainelli. Unfortunately Bologna scored the equalizer only a few minutes later when Criscito got the ball out of a corner on his knee and Bologna could score easily: 1-1. 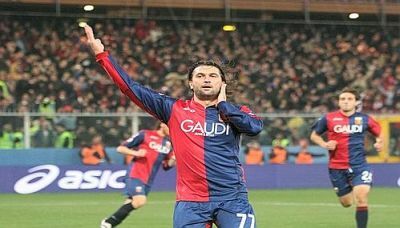 Genoa had to start again, but Giuseppe Sculli helped us to score 2-1. 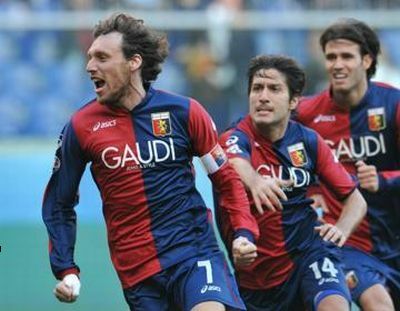 Also this time Bologna came back soon when our ex-player Adailton scored after a big error of Dainelli. Still in the 1st half it was David Suazo who scored his second goal this afternoon (just as Acquafresca last week) after a combination with Marco Rossi: 3-2, halftime. In the second half Adailton scored his 2nd and 3rd goal (dubious penalty on the edge of the penaltyarea) which gave Bologna a 3-4 victory. The Gasperini-boys only hit 3 times the post and the crossbar in the 2nd half. Our second homedefeat of the season (other defeat against Inter: 0-5) was born and we missed a great chance to be inside the Europa League zone. We still have 12 matches to continue our European adventure. 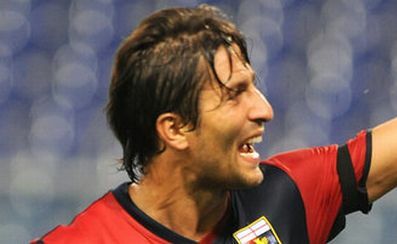 Yesterday-evening Genoa beat Udinese by 3-0. Our new central-forward Robert Acquafresca scored twice, while our returned Argentinian wing-striker Rodrigo Palacio scored the last goal. We have now 38 points in 25 matches and are 9th in the standings. Mr. Gasperini again started with his new defence: Sokratis, Dainelli and Moretti and for the first time with the 3 strikers: Palacio, Acquafresca and Sculli. In the beginning of the match Udinese played good, maybe even better than our boys, but after 30 minutes the match changed. After goalkeeper Handanovic stopped a great shot of Sculli it was Acquafresca who scored in the rebound: 1-0, first goal of Acquafresca in Rossoblu. Despite serveral chances with this score also halftime arrived. 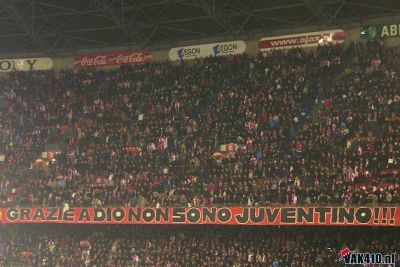 In the 2nd half Genoa played towards Gradinata Nord, as often the most favorite direction of the players. In the 8th minute Genoa got a corner. At the far post Acquafresca surprised defender Coda of Udinese but before our new talented striker could score he was stopped by Coda: penalty. It was only a delay of a minute before Acquafresca could score his first goal in front of Gradinata Nord because he scored the penalty himself: 2-0. Just a litte more then 10 minutes later Palacio headed the 3-0 behind Handanovic after a good cross of Sculli. In the last 15 minutes Jankovic returned after his heavy injury for the first time this season in our team as substitute of Robert Acquafresca who deserved the standing ovation of the public. Yesterday Genoa played a very good match in Turin against Juventus and deserved the 2-2 draw which was on the scoreboard before referee Mazzoleni gave Juventus an unbelievable penalty like the Moggi-scandal never happened. Not only the referee is to blame about this penalty also the linesman who must have closed his eyes at the moment Del Piero showed everybody why so many people don’t like him, the symbol of Juventus. In the 2nd half Juventus was the best team in the field but Genoa created just as many chances as the hometeam. In the 61st minute a great combinaton of Del Piero and Diego – again Criscito was not powerfull enough – gave the hometeam the lead: 2-1. The happiness lasted only 2 minutes when Marco Rossi scored again after a big mistake of Buffon: 2-2. 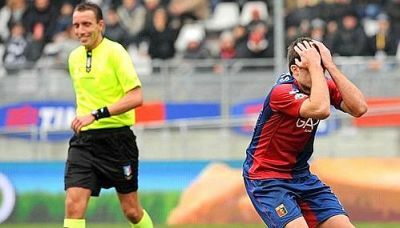 This result also should be the most honest endresult, but referee Mazzoleni decided different. Let’s hope this was his last match in Serie A. 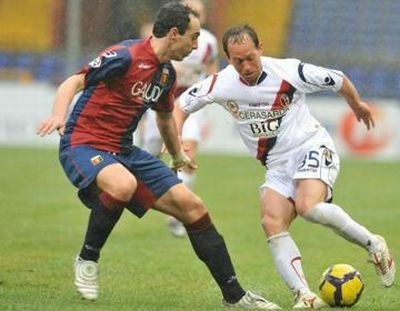 This afternoon Genoa did win the important match against Chievo Verona by 1-0. Our captain Marco Rossi scored the only goal in the 63rd minute. Genoa is now on the shared 7th position in the standings with Juventus, our opponent of next week. Because Biava is sold to Lazio and Criscito was suspended because of his 4th yellow card last week Mr. Gasperini had to change the team. Our coach substituted Biava by Sokratis in defense and put Mesto on the midfield-position of Sokratis last week. Ivan Juric substituted Criscito on the left in midfield, Acquafresca played in stead of Suazo as central-forward and Sculli was on the wingposition of Mesto last week in Naples. Genoa started the match very good and Acquafresca almost scored, but a defender of Chievo ruined the joy of Robert’s first goal with Genoa to kick the ball out of the goal after keeper Sorrentino was beaten. On the other side also our goalkeeper Marco Amelia had 2 perfect saves to keep his clean sheet since Genoa-Bari. Halftime: 0-0. In the second half Genoa played much more agressive and just after Juric was changed by youngster Fatic our captain Marco Rossi scored with a perfect shot: 1-0. Unless the fact Mr. Gasperini substituted striker Palacio with defender Bocchetti our red and blue team stayed the most offensive team in the field. Omar Milanetto was close to the deciding 2-0, but his shot ended on the crossbar. After 95 minutes referee Ciampi finally whistled 3 times: 1-0, game over ! After all we can say that Genoa has become stronger with a real experienced central defender (Dainelli) that we missed the first half of the season after Matteo Ferrari went to Turkey. Also the fact that long time injured Jankovic, Palladino and Kharja are almost ready to play again makes us stronger. 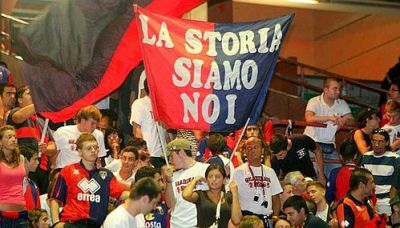 On the other hand it is a pitty we lost real Genoa-players like Beppe Biava and Lucho Figueroa. We wish them a lot of succes with their new teams, just as the other 5 players that left us this month.